Ornamental is a pair of fingerless mitts that follow the Yin Yang principle of plain and ornate as complementary opposites. These mitts are not only decorative, but functional as well by keeping your hands warm and pretty. Sample is knit in the color, #76 Manzanilla Olive. 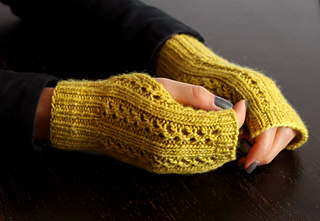 The fingerless mitts are knit flat then folded over and seamed to where the thumb is, leaving a hole for the thumb and then seamed to the top.